Best of Instagram August 2018 Edition: Your Gear. Your Stories. @lukedominguez: I love that it’s lightweight and fits on my back comfortably. It protects and stores all the gear I need for the gig. Love the front compartments. Roland VR09 is my workhorse keyboard. Lightweight, simple layout, quality sounds, and can be used as a controller or standalone keyboard. Earlier this year, I had an outdoor gig in Downtown San Diego. We were playing at the finish line for a charity run. During soundcheck it started drizzling, there was no cover. By the end of the first set, it started pouring. I packed up all my gear as fast as possible; Keyboards into cases, cables and computer into bags. By the time I found my car, which I totally misplaced, it looked like I had fallen in a river. Cool gig though, shame we couldn’t finish our set. @bobal3x: Apart from the ample safety and protective features it provides for the instrument, I love how convenient and practical the design of the bag is, from storage to the ease of carrying around, especially having to wear it and walk around, its miles ahead of what I have been used to in the past. Well, everything you see in this flat-lay are my bare essentials, they go with me to every performance. This has literally been the basis of my rig for the past 9 years, and I don’t remember playing a show without them, but if I was forced to pick one (apart from my bass and the MONO M80 to carry it) it would be the Darkglass B7K Microtubes Bass Preamp pedal, because with it you can get the beefiest of overdriven bass tones, just how I like it. A funny instance that happened during the band’s tour through Europe this May. 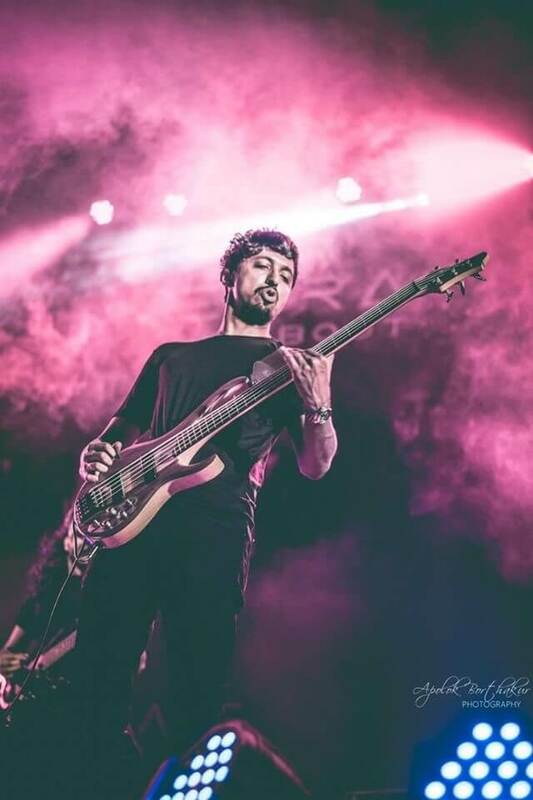 We were performing at a post rock festival in Berlin, and at the end of the very first song, while we were jumping around on stage the frontman bangs into me, his guitar hitting my bass right at the bass guitar jack, and my bass stops working. And we have another 35 minutes on stage. Now I’m panicking, wondering how to go about this because I am travelling with just one bass. After two songs and a lot of messing around with the cable and jack, I somehow manage to get my bass to work, but for it to work without loss in signal I had to stand perfectly still, like a statue, and play the rest of the set, which was kind of weird as standing rock steady and performing is something I’ve never experienced before haha. I had a few hours after our set got over to fix my bass as the very next morning we drive to Prague, and after calling about 20 different numbers, Albert who runs the company called Amp-Fx and specialises in hand made analog pedals and amps in Berlin, answers my call and agrees to help me fix my bass in a very short notice. That was a complete stroke of luck. @alexxvdk: I like my MONO bag because it is perfect to move! I need to take my guitar every day because I teach after school! And the MONO Tick is perfect for the cables and pedals. I even take my guitar to go and drink beers with my friends at the citadel of the city! The sound of my guitars (Haar) is really different even though they are both strats. 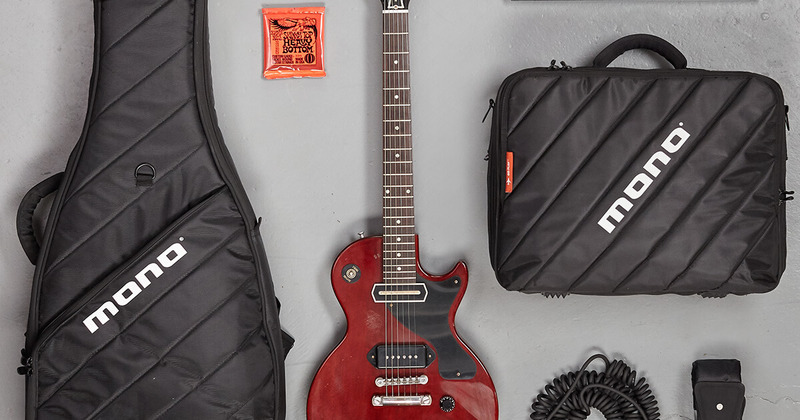 The sunburst sounds very 50’s and the rose has a more modern sound with the humbucker. 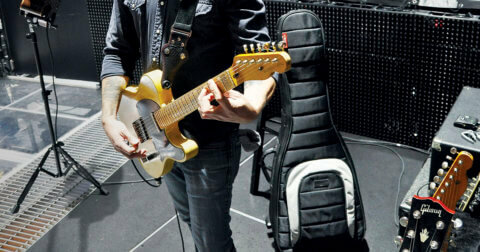 These are my two favorite guitars. 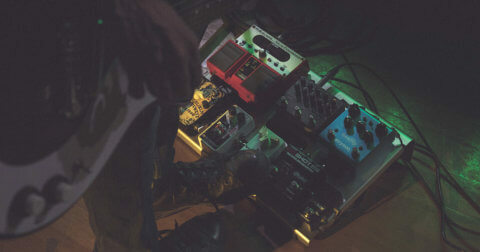 About my pedalboard, I could not do without the Bigsky which is amazing! The Tchula is always on too, that’s my sound. It’s amazing seeing all your photos on social media. We’re very thankful to everyone who has taken the time to set these up, take photos and share them with us, keep them coming! If you have photos of your MONO gear – tag us on Instagram @monocreators. If you want to share a flatlay of your gear, remember to hashtag #MONOfits on Instagram. We’re always looking to share incredible photos from our users – who knows, yours could be the next. Best of Instagram March 2019 Edition: Your Gear. Your Stories. 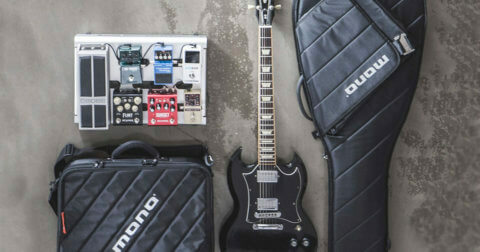 Best of Instagram February 2019 Pedalboard Edition: Your Gear. Your Stories. Best of Instagram January 2019 Edition: Your Gear. Your Stories.